The Olympic medalist talks to us about his passion for politics and the importance of voting in November. Six weeks from the 2018 midterm election, it feels like the stakes have never been higher — particularly for LGBTQ citizens, as issues like "religious freedom" and gender identity become explosive talking points for candidates fighting for control of the House and Senate. With a recent poll suggesting that only 28 percent of young voters are certain they'll turn out to vote, it's easy to feel anxious about the results. 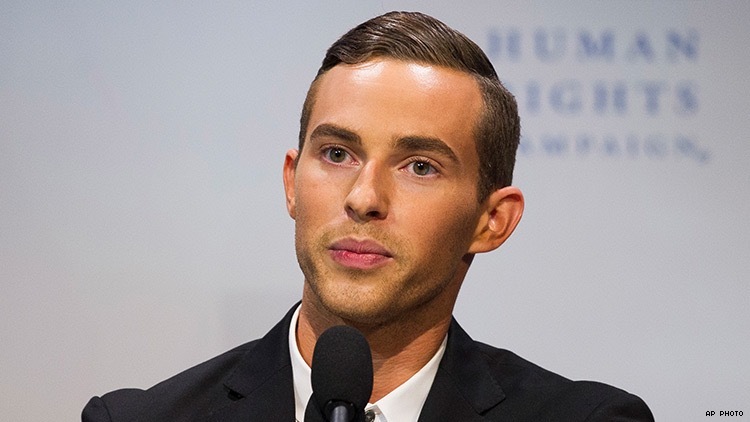 This week we caught up with Olympic figure skater Adam Rippon, who burst into the political scene with a high-profile feud with Vice President Mike Pence and a personal boycott of Team USA's White House visit. He talked about the voting efforts he's supporting ahead of the midterms and how he uses social media to get people involved. The Advocate: Since the Olympics, your reach on social media and your visibility have skyrocketed. Has this made you more strategic about balancing entertainment and politics? Rippon: It's really important [to balance it]. When you are trying to reach people who may not be registered to vote or may not know what to think, in a way we're more open to listening to people who we feel like we know. Social media is a great platform for you to introduce yourself to people, for them to know you as a person, to know your personality so they feel like they're friends with you ... [you can] get your point across at more of a human level, instead of it sounding like a PSA. My favorite people to follow on social media are like that. I feel like I know them; I look forward to watching their stories and seeing their posts and reading their tweets. And when they talk about different issues that are important to them, I want to listen and hear what they have to say. Right — authenticity is important for getting your message across. Absolutely. People can see right through something that isn't genuine anymore. And the main way of getting information out is through social media, Instagram platforms or Twitter platforms. It's from those personal accounts, more so than from a big company or a big group. I think that people are more inclined to hear what specific people might have to say. A lot of the media narrative surrounding you after the Olympics was about whether you would meet with Mike Pence and what you might say to him. Heading into the midterm election, where do you want to focus the conversation? I think that my spat with Mike Pence, if anything, shows that I want to be involved in politics. I've always been passionate about it, I think it's really fascinating. As somebody who came from the figure skating world that has its own set of drama, politics is a whole new level of drama. It's so much fun, and interesting to get involved and learn about and see the process. But I have seen this younger generation, even younger than me, getting involved in politics and making a huge difference within their communities. You see people really taking a step forward to do a lot. I think it's so cool, and I want to be a part of that movement, to get so many people involved. Because it's so important, now more than ever. It was announced during the Video Music Awards that you’re a part of MTV's +1 the Vote. Why was that an important project for you to get involved with? It was important to me because when I was younger, I watched MTV all the time. I'm not too proud to say that I watched Jersey Shore and loved it. And a network like MTV is a great way to balance entertainment and politics. When you are young and you haven't registered to vote yet, it's so important to get out there, to register, and start to learn about different issues that are important to you. It sometimes feels like you're alone and you're just one vote, but sometimes one vote is the most important, or you inspire somebody else and it becomes a movement. Any other political projects that you're getting behind? I’m starting to work with When We All Vote — it's Michelle Obama's campaign to get people involved in the midterm elections. It's a nonpartisan organization where they're just getting people registered and involved in the political process. There are so many issues that are so important. If there's something that's affecting everybody and you find that one issue, that's your reason to get behind the vote — that's your reason to find a candidate who best suits the ideals of what you think is going to be best for your community and your country. You've liked a few tweets from New York congressional candidate Alexandria Ocasio-Cortez. Why do you think she's been such an appealing candidate? Because, just like I said, social media is where you get to know people. And there's this one tweet that completely stands out to me — she has her old sneakers, and the soles are completely worn out and they're a mess. She said that those were the shoes that she wore when she was going door-to-door, meeting with the people in her community and finding out what they wanted. She was on the ground, doing the work. That's what was so appealing about her, and so cool — she is one of the people [who is] stepping up, because she wants to make a change within her community, and she's really doing that. I think somebody like her inspires more people to get into politics, because sometimes you feel like, "What can I do, why would people listen to me?" Any other message as we head into the election? The only thing I want to say is get involved — get registered. If you want to make change, it starts with you. ADAM RIPPON is an Olympic bronze medalist, the winner of Dancing With the Stars: Athletes and a judge on the upcoming Dancing With the Stars: Juniors. You can follow him on Twitter and Instagram, and support his initiative with GLAAD to raise money for LGBTQ youth programs.